One of the most unmissable new sights from Animation Courtyard for many weeks now has been the bright, turquoise gas station canopy of Flo’s V8 Café. Now with a full roof and a clean, modern finish, the canopy has, since our last update, also received some new decor on top, matching exactly that of both the film and the concept art. The spark plugs are mounted on enlarged bolts since, like the film, certain elements of the sets are based on the parts of a car. The bolts have been given a weathered paint job transitioning from steel grey to a dirty brown, whilst wires can be seen in place all over the spark plugs. Just like the CGI film, neon lights will zig-zag up each spark plug before forming a zig-zag star burst around the top of the plug. Next door, the part of the building where guests will enter the queue, roughly based on Ramone’s House of Body Art (which is itself based on the U-Drop Inn in Shamrock, Texas), has now taken its final colour and a similar amount of the Imagineer’s trademark weathing treatment. An incredible reproduction, at least from the angle visible so far, of both the location in the film and the real-life inspiration, the accuracy will no doubt help greatly to make sure guests feel as if they’re on a real movie set for the CGI film. But what do all good movie sets need? A backdrop! Be it a sandy Agrabah or a colourful Toon Town, the Imagineers of Toon Studio already realise how a good backdrop can create an enveloping themed area in a relatively tiny space. Next on the list – Cars Race Rally! Already to be seen rising in the first photo above is the impressive steel frame for this huge new backdrop, due to rise far higher than the buildings themselves to truly reinforce both the grand feeling of Route 66’s scenery and the canyon theme of the ride platform area. 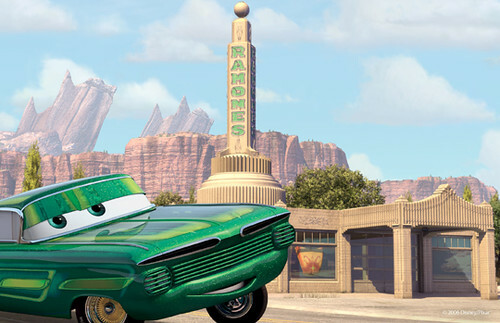 Hiding in the background of various pieces of concept art since the ride’s announcement, the backdrop will be inspired by the film’s Cadillac Range, a series of jagged rocks atop a canyon wall. From reality, to CGI, to reality – only Disney-Pixar do it this way! Photos 1-3 by Photos Magiques. You can see even more here. Photo 4 from Route 66 News blog. Actually, the cars at the real-life Cadillac Ranch aren’t cut in half. They are planted nose-down into concrete that’s below the surface. 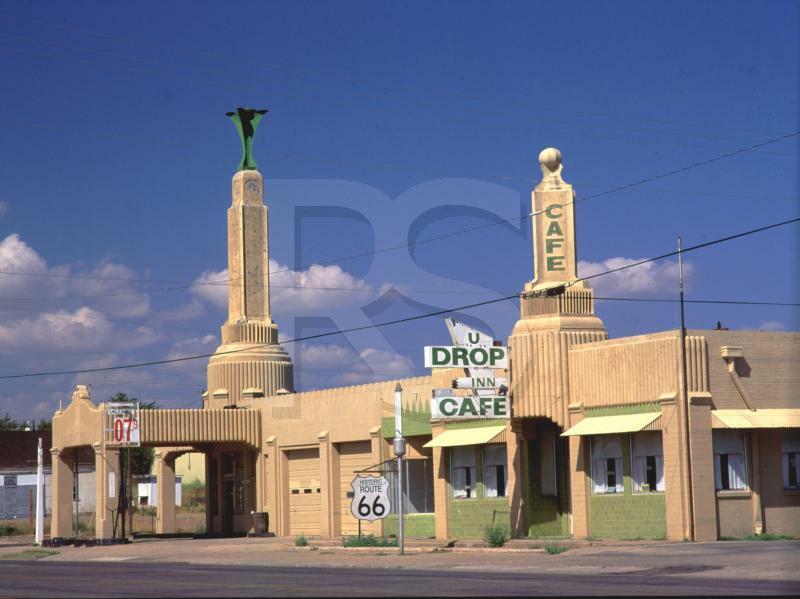 In fact, the whole complex was moved a few miles west a number of years ago when Amarillo’s sprawl encroached. The sculpture’s owner wants the surrounding area to be as desolate as possible.